History, development, service, specifications, pictures and 3D model of the German warship. 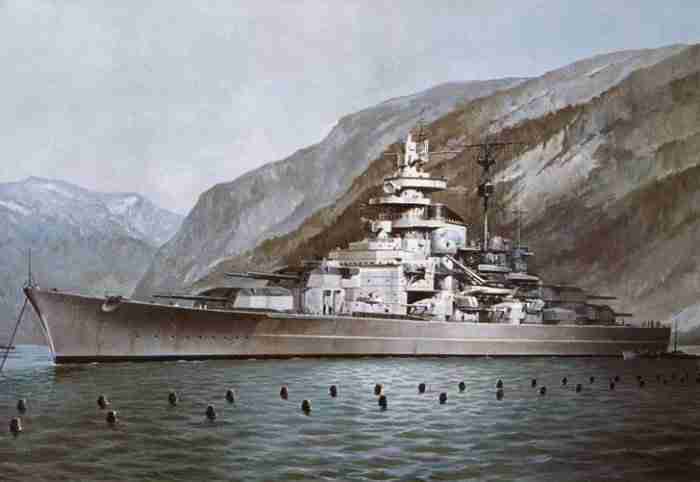 Battleship Tirpitz of Bismarck class. Similar in nearly all ways to her sister-ship battleship Bismarck, the service of battleship Tirpitz was, to every one intents and reasons, quite as long and ambitious as her sister ship was­ short and great. But this might neglect the effective results of the 2 warships, one of which caused a 10-day long convulsion in the Royal Navy in Home and Atlantic Waters. It resulted in the exchange of a single outdated and unmodernized battlecruiser for a brand­new battleship, while the other ship pressured the Royal Navy to remain 2 battleships, an aircraft carrier and assisting navy ships in seas where they weren’t usually required for a time of almost 3 years, just by taking up dangerous placements in Norwegian fjords. Tirpitz had been laid down at the Wilhelms­haven shipyard in Oct 1936, launched on April 1, 1937, and finished for ocean tests on February 25, 1941. She differed from her sister-ship in insignificant aspects, like her airplane hangar and crane arrangements and the inclusion of 2 quadruple torpedo­tube mountings to be used versus merchantmen. Tests and work-up in the Baltic, with trouble modification at Kiel, fully engaged 7 months and not before September 20, 1941, was she reported to be operational. She was right away sent on her primary mission – an unspectacular cruise off the Aland Islands, at the entrance of the Gulf of Finland, from September 26-29, to shield versus a potential break-out by the Russian navy from Leningrad. 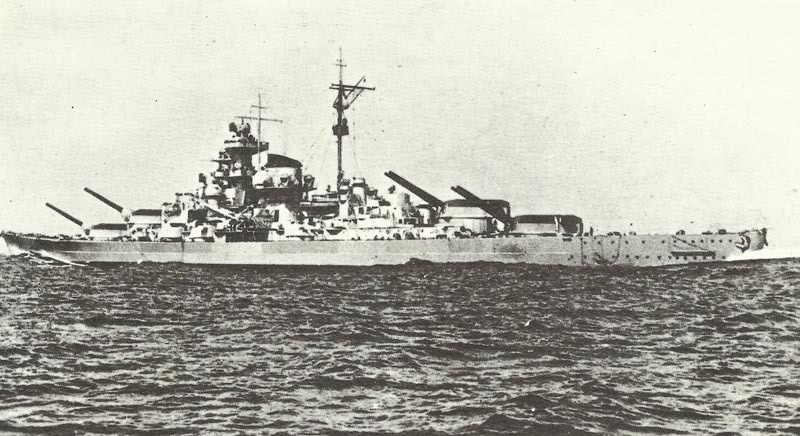 Afterwards, Tirpitz continued to be in the Baltic, working out, until January 12, 1942, when she departed from Kiel to relocate to Trondheim through the Kiel Canal. Similar to her sister ship, she had never been returned to Germany. The German battleship Tirpitz with her guns elevated to port. The key role of battleship Tirpitz was to intercept Allied sea transports to northern Russia, either by straight interception or by the threat of raiding of the arctic convoys destined for Murmansk and Arch­angel. Her solely complete mission for this reason started on March 6, 1942, when she departed from Trondheim to raid the Murmansk-bound convoy PQ 12. Spotted and as reported by British subs soon after departing her starting point, the German battleship and her 3 escorting destroyers didn’t find the con­voy, which had already been redirected by the Admir­alty faraway from its scheduled direction. Tracked occasionally by way of decoded radio signals, Tirpitz was attacked and just nar­rowly missed by planes from the aircraft carrier Victorious, out of Narvik on March 9. Tirpitz gained her most significant success against the convoys at the beginning of July 1942, just by relocating from Trondheim to Altenfjord, in the distant north of Norway, where her appearance nearby the course of Arctic convoy PQ 17 resulted in the Admiralty’s order to scatter the merchantmen of the convoy on July 4. Tirpitz didn’t cruise before July 5 and was reported 3 times and attacked one time by a Russian submarine within a sortie which continued fewer than Twelve hours: she had absolutely no direct partition in the destroying of the Twenty-four Allied vessels lost from the convoy. While she never again sailed to intercept a convoy, the threat of her interception forced the Royal Navy to keep a minimum of 2 battleships and an aircraft carrier in Home Waters, to shield the convoys and to protect versus a venture into the North Atlantic. In October 1942, an effort to attack her at Trondheim employing human torpedoes (Chariots) stumbled on to nothing by the accidental loss of the Chariots within 5 miles of Tirpitz’ anchorage place, where she was at that period of time refitting. 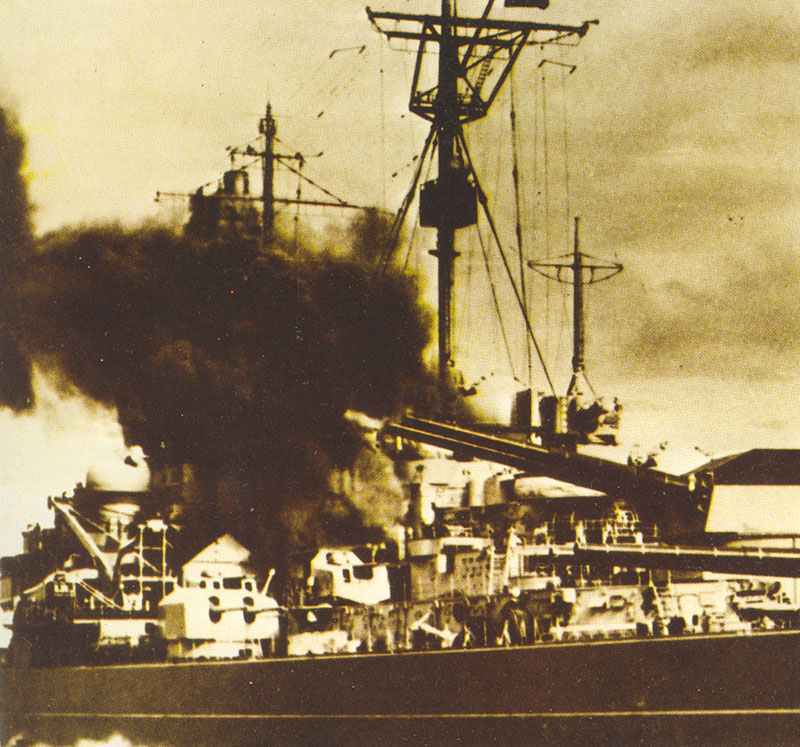 The battleship Tirpitz was bombarding Spitzbergen in 1943. The great warship started to be in business once more by the end of January 1943 and in March she was transferred to Altenfjord which turned out to be her per­manent base for the following Nineteen months. At this point she was accompanied by Scharnhorst and the heavy cruiser Lützow: outstanding results were in progress somewhere else throughout the spring and sum­mer of 1943 and the Home Fleet battleships have been transfered to the Mediterranean sea, hence the sailing of the Russian convoys was stopped until November 1943, providing the strong German squadron without any aims. Finally, at the beginning of September, Tirpitz and Scharnhorst were found business, even though bombardment of almost­ defenceless Spitzbergen seemed to be almost not a suitable job for these great warships. They were sailing from September 6-9, and this 5th sortie was to be Tirpitz’ final, for on Sep­tember 22, a pair of British midget submarines X-Cratts placed explosive charges which prompted exten­sive impact destruction of the primary machinery and gunnery devices. Repair works were carried out in outstanding engineering outcome, but as she was possessing going ahead to start tests on April 3, 1944, she was bombarded by Forty Home Fleet Barracuda dive-bombers and exten­sively damaged. Additionally attacks in July and August, by which moment she had been fixed once again, caused just insignificant damage. The Royal Air Force was flying unsuccess­ful strikes on Tirpitz at Kiel in 1941 and also at Trondheim in March as well as April 1942, however, not before the autumn of 1944 did Bomber Com­mand get the proper mixture of planes (Avro Lancaster Specials), bombs (12000­Ib-Tallboy bomb) as well as stabilized automatic bomb sight to carry out a strike at an extremely range a prosperous mission. On September 15, Twenty-seven Lancaster bombers started from a Russian airfield and obtained a single direct hit with a 12,000-pdr bomb which hit right forward and generated intensive dam­age within the 118-feet part abaft the bows. Fixing this kind of serious damage were being out of the question in Norway and on October 15-16, Tirpitz started under her own steam to an anchorage close to Tromsö, where she would be to form section of the fixed defences, as a floating battery. Tromsö was inside range of bombers located in northern Scotland and she was bombarded by Thirty-two Lancaster bombers on October 29, this strike gaining just one near-miss. The hull of the capsized battleship ‘Tirpitz’ stands out from the fjord at Tromsö. The final arrived on November 12, 1944: Twenty-nine Lancaster bombers scored 3 hits along with a very close miss amongst B and C turrets, opening the mid­ships port side from the keel towards the waterline and resulting in Tirpitz to capsize eleven minutes following the first bomb had been dropped. Over 1,000 of her crew were lost together with her. Launch of Tirpitz on April 1, 1939. The massive bow of the Tirpitz. 38-cm front turrets with superstructure. Guns of turret C elevated. Behind a heavy cruiser. Tirpitz is moored in the Norwegian Fetten fjord, where the rocky shore offers a natural protection against air raids. The German squadron in Norway, 1943. The aft turrets with their 38-cm guns are firing. The turrets A and B are firing a full salvo. The stricken battleship Tirpitz after the 12 November 1944 attack by 31 Lancaster bombers. The ship was hit by at least six 12,000 lb Tallboys, one of which caused an explosion in one of the vessel’s magazines. Tagged 1942, battleship, germany, kriegsmarine.